Television is a relatively new medium, but already it has gone through many changes which have come about mainly through technical development. It has also changed its position in society, from an experimental novelty, through an amusement for the wealthy, to probably the most powerful medium in the Western culture. It may already have passed the peak of that power and may become merged with other digital media in the next few decades. 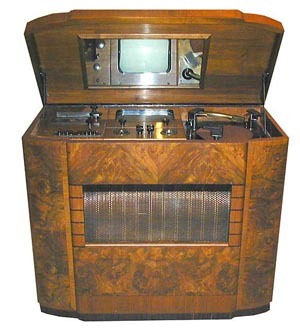 British television started with the experimental transmissions by the BBC in the late 1920s, using a mechanically scanned and reproduced imaging system invented by eccentric Scotsman John Logie Baird. What is probably the most remarkable thing about it was that Baird managed to persuade the BBC to transmit his signals, which were of such poor quality that it was doubtful if it had much entertainment value. The important thing was that it proved it was possible to transmit moving pictures of live events over a public network which could be viewed by anyone with the appropriate apparatus, which was a relatively simple device that could be attached to a normal radio receiver. Despite the poor resolution, signals were received from London as far away as the Equator. Very little has survived form this period, as it was a short-lived system that appealed mainly to experimenters. The Baird company sold complete vision receivers called Televisors, which were mechanical devices coupled to a receiver which was either supplied or a commercial set could be used as transmissions were on the conventional broadcast Medium Wave band. More popular were kits which the buyer built up themselves, and individual parts could be bought to make your own set. We have been fortunate enough to have a couple of Televisors through our hands, but there is no known surviving production equipment. There is a very realistic copy of Baird's original experimental apparatus, including the dummy head 'Stooky Bill' he used as a model, in the National Media Museum in Bradford. There is much information already available about Baird. In 1936 the BBC set up a television studio complex at Alexandra Palace in London. The Baird system had improved immensely, but there was a serious rival in the all-electronic system invented by researchers at Marconi-EMI. Both systems were capable of producing pictures which were transmittable, so the two systems were trialled side by side, each having complete studios and transmitters. Due to the higher frequencies used, the range was less, around 30-50 miles, but freak reception was reported from much further away. 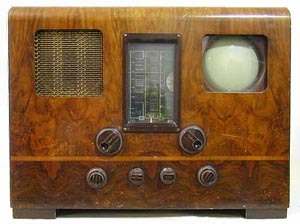 Most of the major radio industry names started to manufacture commercial television sets, but almost all used the cathode ray tube type of display which was an important part of the EMI system. Many people believed that television sets, then selling at a price equivalent to a family car, itself a luxury beyond most people's reach, would remain too expensive for mass sales. Cinema companies were unsure about it too- in the 1930s the cinema was a hugely popular medium, with picture houses in every town, and many people attending more than once a week. However, they did see potential for showing large screen news programmes which could be relayed instantaneously, something impossible to do with film. The Marconi-EMI system used a vacuum tube device, which they called the Emitron. (It was similar in principle to the Iconoscope invented by a Russian scientist Vladimir Zworykin, although EMI claimed it was an independent invention.) This used a photo-sensitive plate scanned by an electron beam, the difference in charge between light and dark areas producing a changing electronic signal, locked to the scanning beam by pulses which kept the system in time and enabled the resulting image at the receiver to be locked into a picture reproduced by a spot of light on the screen of a cathode ray tube. The speed of operation fools the eye and brain into seeing a continuous moving image, which is in fact built up by a moving spot in a series of 'frames' which last for a twenty-fifth of a second. After experiment, a standard of 405 lines per frame was adopted, and this remained in use in the UK until the 1980s, although another standard of 625 lines was introduced in the early 1960s and gradually superseded the original standard. From 1938 it looked as though television was here to stay, and plans were made to extend coverage to the rest of the country, and increase the number and variety of programmes. The radio industry knew that sales of wireless sets were approaching saturation, and the new technology of television would be a challenge, but a potential new market. Then, in 1939, everything changed. Even at the 1939 Radiolympia exhibition, the major trade show in August where next year's models were on display, every major company had TV sets or combined radio and TVs on their stands. Catalogues showed many new 1940 models under development, some of which were probably never made. The outbreak of war on September 3rd put an abrupt brake on the whole concept of television. The transmitter at Alexandra Palace would have acted as a perfect beacon to guide German bombers to London, so the service was immediately closed down, and production of television sets was stopped. The technology of television was not abandoned however- the science of very high frequency radio waves and cathode ray displays had another use, which was top secret and of vital importance to the war effort- Radar. Many of the engineers involved in the development of television were at once put to work on what would become an enormously important defence science that would save the lives of thousands of servicemen and civilians. 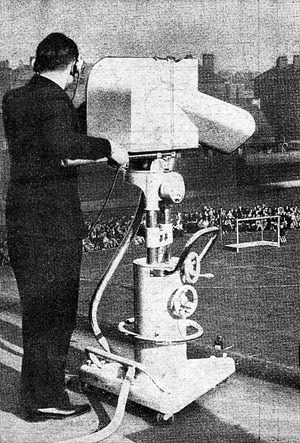 Television studios were closed and silent, although Alexandra Palace transmitter was used to misdirect enemy bombers using a radio guidance system. 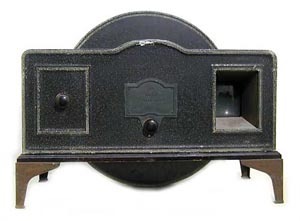 Television production was on hold for the duration and in the homes of those who had been fortunate enough to have a receiver, sets were put away or used only as radios, and would remain useless until 1946.